It is likely to be slower growth because we just don't have the resources to continue at the rate that we expect. Business as Usual is not an option, it will be radically different. When we get really stuck, then perhaps some of the already existing research, innovation and new products (for instance, alternatively powered vehicles) will come to the fore, when vested interests can no longer hold them back. I think we have to go this way. Growth will slow. For organisations to succeed and 'prosper', goals will need to be more along the lines of social and environmental benefit – stakeholders first, not shareholders only. We will have to learn how to work with paradox (as many Eastern cultures already do) – holding paradox in our minds until a solution emerges. It is a balancing act where individuals and organisations will need to exercise choice. Aware that there are choices, and thinking carefully before making them. No polls point to a significant change in attitude towards self-betterment. People do indeed endorse environmental and quality of life propositions, but they also show very much the same patterns of aspiration as they ever have. So no, we are not going to decide from our own volition that "we cannot go on like this", and neither are we going to adopt a less aspirational life style. With wealth comes leisure, and with leisure, choice. Those choices have always been baroque - just read the antics of the very rich in the Eighteenth century - but they rely on the basic engines turning, peddled by Morlocks. I see our situation as a very different one. If there had not been the financial crash, the younger emerging world would have gradually caught up with us, the industrialised nations. (In parenthesis, the notion that poorer countries would suddenly subscribe to this voluntary restraint is absurd.) The crash has, however, taken the impetus out of growth for the industrial nations, and my economists say that we will not be out of it, at best, for another five years. So the West will grow at about a third of its innate potential for ten years. This may or may knock onto the emerging economies, but the catch-up period will clearly be reduced accordingly. They will have invested comparatively more - or the West correspondingly less - in industries that are presently safe from competition. That implies a much faster onset of competition in areas that we might otherwise have been able to protect. That tells me three things. First, competition will arrive faster and harder than anticipated. Second, that uncompetitive industries (and countries) will be hard hit, swiftly. Third, that calls for protection will be extremely loud, particularly from the low skilled and the beleaguered industries, and probably synchronised internationally amongst the wealthy countries. Your assumption is that "the West" will behave like a single entity. It will not. Some bits of some countries will follow a pattern that breaks with history, but most will not. It is not possible to legislate for this, as it flies in the opposite direction to the very principles around which our society is organised. Everything is organised around maximising individual benefit through exchange of what you own or what you can do. This is not even about maximising collective benefit. It is supposed to benefit nature, at the expense of human wishes and collective behaviour. Practically, we have trouble on the streets because growth is not even negative, but low. Imagine a state where we declare that there will never be growth again, and that each will be confined to their lot in life, like medieval peasants. This is the sort of thing that Great Leaders do to countries under totalitarian regimes. It never lasts, is never popular, in either sense of the word, and always breaks down in the status quo ante. You asked (in the summary note: Ed.) " How could the West achieve a surge of renewal and growth?" Had you ended your question 2 words earlier, the question becomes the major question facing the West (and the rest). As it stands, your question reflects the dominant and well-entrenched dream that grips our imagination so tightly that we cannot, yet, imagine any desirable future without economic growth. Pity. If we have a future it will be beyond growth as our core civilizational aspiration. Sadly, there are almost no scenarios that see a future without growth as other than tragedy. Ironically, the deep bias towards growth at all costs of our modern/Industrial form of civilization is likely to contribute to the very tragedy that we claim to want to avoid. I am responding to your e-mail request for something about the industrial nations. Renewal in the rich nations requires a bit of analysis as to what "renewal" would mean. I paraphrase, economic convention allows three factor of production physical assets, labour and efficiency, each of which come with a volume and quality parameter. Let's pick those off one by one. The industrial world has most of the physical assets in the world, but many are of historical quality, or worse. These need to be scrapped, which the recession is achieving quite effectively, at least in those areas where the industry is not trapped by decommissioning costs. However, the industrial world lacks projects and so investment is weak, both with regard to upgrades and replacement. Let me come back to why it lacks projects. The world workforce expanded enormously in the 1990s, in part due to emerging economies, in part due to the full arrival of women in the workplace. That has had the effect of making labour cheap globally. It has had the effect of making skilled labour much more expensive than previously the case. 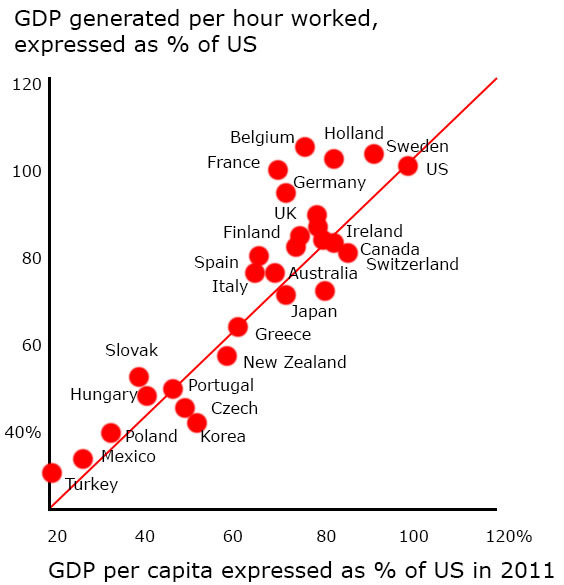 The OECD has carried out assessments of the origins of labour productivity within the industrialised countries. This varies considerably by country, with Switzerland showing no growth over the period and Ireland showing a 3.5% per annum increase. Most delivered between one and two percent per annum. The interesting outcome of the work is, however, that typically something under a half is due to capital deepening p that is, investment in machinery that makes people more effective and the remainder to the more effective use of people, or the shift in the economy to industries in which people are more efficiently used. The latter predominated, according to the OECD. So we have a picture of economies shifting away from labour intensive sectors, outsourcing the required work overseas, mechanising that which cannot be outsourced and focusing on a new portfolio of industries that demand greater output per person from their participants. Those who cannot deliver this do not work, or work part time. Labour quality is, in abstract, high. There is frequently a mismatch in the skills with which the educational system of the industrial world equips its people and the needs of its commerce. In particular, many countries lack a dual track, whereby someone with chiefly applied, manual skills can take these to extremes. The word "engineer" now tends to mean a desk-bound professional rather than a person embedded in the heart of a complex machine, tending its vitals. Universities have expanded as a rite of passage, and have tended to reinforce the message that thinking is better than doing. Only Germany and Japan seems to have escaped this trap. This psychological mismatch seems also to extend into commerce and particularly into the state. That is, goals are obscured in favour of process, and process for the endless critique of abstractions. Small firms are clear about roles, about goals, about tools and about priorities. Everything else seems doomed to a relativism that prevents clarity on any of these. Everybody knows the meeting convened to discuss concerns at best peripheral to the organisation. Managements find it hard to talk cleanly with the organisation, as every initiative is picked apart and woven into the same muddle. The are briefed it the same terms, by people whose academic training causes them to weight every option as equivalent and equally likely. It is the task of staff work to simplify the complex and present loose choices in terms of sharply defined options. If this is not done, management lose the necessary conviction and confidence that allow them to act briskly. Basic no-skills, no-frills muscle labour is almost extinct in the industrial world. Those who by capacity or background refuse to "upgrade" are doomed to welfare. The gradient of remuneration to skill curves are everywhere strong and everywhere strengthening. Unionisation is on the wane, everywhere except certain state industries and union monopolies, such as medicine. This trend can only be reversed if jobs are repatriated from the emerging economies, which in turn will only occur if one or a combination of three things happen: Western protectionism, sharply rising labour costs in the EMs or instability in those societies. The first is all too possible, and disastrous. The second has been discussed already - sudden unionisation across the major Asian economies, a thought which was new to me. The chaotic model is hard to see as a general feature - conflict between China and India, or some such - as other nations will quickly drop into place if one becomes unstable. Efficiency here means effectiveness in the use of the other factors in the pursuit of a specified set of goals. As already noted, goals are complex and being made more so than is perhaps necessary. The partial renaissance of shareholder power, the need to configure for IT and enhanced international competition had a major sharpening effect on Western companies - on the world economy - during the 1990s. Most countries showed a secular increase in multifactor productivity over the 1985-2005 period, with net efficiency (TFP - green in the figure) playing a major and sometimes dominant role. Small companies - under 250 people - have become efficient much more slowly than large ones in every OECD country over the past twenty years. They, in effect, mop up labour while the large organisations generate returns. Large Japanese companies are four times as efficient in their use of labour than are small ones, for example. Efficiency growth is has be split pretty evenly across manufacturing, market and support services, with considerable variation by country. Manufacturing has tended to improve at about 4% per annum, services at 2% or less. Within services, retailing and activities such as catering have not shown much growth, but transport, finance have done better. Countries with lower than average per capita income have improved more quickly, for a lower base, than wealthy counties. This recapitulates the general catch-up that is characteristic of the EMs. One element of efficiency is innovation. This is extremely difficult to measure. However, the speed with which systems are emulated - or war destruction is replaced - suggests that finding new things to do is a limiting factor in economic growth. These may be "new things" in the sense of process or product innovation, but also may consist of new regulatory structures and other intangible infrastructure. Certainly, excellent intangibles do lead to obvious innovations. They range from physical proximity to similar firms, a clear sense of direction in the firm or in the entire industry, fine support systems and supportive government - as opposed to, say, grudging acceptance of GM agriculture - and cross pollination with other related industries. Fine, you say, a great round-the-houses; but what does it tell us about renewal? Plainly, a lot of renewing is going on, as Figure 2 plainly shows. The issue for most companies is the utter vagueness of the operating environment. Will things take off or will the potential Euro collapse trigger another recession? At what speed with consumption pick up? How much attention really needs to be given to environmental issues not already in legislation or forced by consumer preference? So they cut costs, and think about M&A for scale and further cost cutting. That is not going to give us renewal. What we need are three things, one short term and two long. The short run issue has just been discussed. Governments should have no other priority but to get the global macroeconomic system back in balance: no vanity projects, no hanging onto exchange rates. The notion of protectionism should be as unspeakable as racism of other current taboos. The longer run issues are, as indicated, two-fold. One of these slightly tautological: to get innovation-based renewal, we need the correct conditions. I like the concept of a "strategic environment" - that is, an industry of supply chain that is completely aware of the things that need to happen and are going to happen. The aerospace industry used to be like this, and so did computing. So was energy, to a degree; and in various countries industries like retailing have taken fire. How this is to be brought about goes way beyond his note. The second issue is about human resources. Companies treat people in a different way now from even a decade ago. For, example, the metric and target culture; the indifference as to where human resource comes from - in house or from a contractor - and the fact that this environment has made all but the most basic training costly and, to the individual company, useless. This is part stems from the utter lack of medium range vision in most organisations: they are fighting today's fires. Often yesterday's fires. The state-mediated flow of human resource is also dreadful. Some of the reasons are given earlier - the ethos is wrong, the skills are wrong, and where they are right the academic model is one of throughput, whereby the fledged graduate never expects to receive education again. This is plainly wrong for today's world, with its extraordinary pace of specifically technical change. There is no question that a small cadre need to "learn to learn", but a far large block need to learn to do, and to be kept up to date with whatever they are doing. It has often been said that "history does not repeat, but it rhymes." Thus we should not expect the future to unfold exactly the way the past did. There is no reason to expect a great spurt of growth for the U.S. On the other hand, we should not be shocked if it does materialize. A very persistent lesson from the past is that predicting the future is very difficult. Railway Mania investors learned this at great cost. As another example, Britons of the mid-19th century worried about the potential threats, economic and military, from the United States, czarist Russia, and, perhaps most, from their ancient enemy France. Hardly anyone worried about Germany, the ancestral home of the British royal family, and at that time broken up into numerous independent states. Still, there are many useful lessons we can draw from the experience of the mid nineteenth century. One can easily dismiss that period as ancient and irrelevant history. But that would be a mistake. There is value in taking a long view. The early 19th century is particularly instructive, as it saw several sharp financial crises. It also saw the emergence of modern capitalism, with corporations almost impossible to set up legally in Britain until 1825, and general limited liability only becoming available in the mid-1850s. Therefore this period is one of the richest available in terms of illustrating how and why the basic institutions of modern economies arose. As a small example, Britain managed its huge national debt by relying on debt instruments ("consols" and similar bonds) that were perpetual yet callable. That meant that sudden spikes in interest rates, associated with wars or financial crashes, had limited impact on government solvency. Compare this to the danger that Italy and other European countries are facing, with the need to refinance over the next few months large fractions of their (much smaller) national debts. There was certainly a cost in terms of higher interest rates to British financial policy. But in retrospect one can argue that British authorities were wise to take that course, and that in general they were smarter than ours not to be deluded by the promises of liquid and rational markets, and were prepared for upheavals. For all the sophistication of our economic theory, our ancestors may have been more sophisticated than we are in truly understanding how the world works. The British elite were certainly not treating their national debt in a lackadaisical fashion. There was a constant search for economies. National creditworthiness was regarded as paramount, and a key to Britain's victory over the larger and richer France in over a century of wars that ended in 1815. While there are frequent claims that debt levels exceeding 90% of GDP are dangerous, it is worth remembering that the UK had periods with debt more than twice as high; not only in the early 19th century, but also after World War I and World War II. On the other hand, Greece has been in default for about half of its modern history, since gaining independence in the 1820s! So it is not just the absolute level of debt that matters. Other factors also play important roles. What made the "Great Victorian Boom" boom possible was the growth of private enterprise. The British elite made valiant efforts to encourage it. The second quarter of the 19th century was perhaps the most extreme example of laissez faire policy in history. However, it was not complete laissez faire, as the government took active steps to promote economic activity. Lawyers could drag on private lawsuits - such as Jarndyce and Jarndyce - for decades. However, once Parliament approved a railway project, say, the exercise of eminent domain land condemnation was swift. Landowners were compensated (overcompensated, in the view of railway promoters), but the process could not be dragged on for years through lawsuits and environmental impact statements. The notion of regulating interior decorators, as some states in the United States do, would have seemed ludicrous. At a higher level, British observers were right to be paranoid about their future. The boost that the Railway Mania and other factors gave to their economy did lead to the "Great Victorian Boom." However, they did not reform their economy and society, and by the end of the 19th century both Germany and the U.S. moved firmly ahead of Britain in economic and technological developments. Finally, we should always remember that pleasant surprises do occur. Furthermore, what seems a serious handicap may actually turn out to be a useful feature. For example, the seemingly crippling national debt gave Britain a large and sophisticated financial system that could cope with the huge demands of the railway industry. I'm not sure that you (Comment 4, Ed.) are kind either to universities or to employees. From the employers' perspective, to be sure, there is a supply problem. But what is it? First, what they want is three to five years' experience. So the shortages that they report relate to people who have quite specific skills, and those skills are work-experience based. Second, the means by which they recruit is increasingly filtered through software. Major employers have made it easy to apply for their jobs. Now they're flooded by thousands of applicants for specific positions. This would be OK if it wasn't for the limitations of the software. It cannot begin to assess personality, or the other human factors that are of central importance. It cannot assess long-run potential, merely match a template to a list of ticked boxes. Peter Cappelli calls these specifications for "unicorn people". Looking from the supply situation, a graduate has to try to look ahead four years to guess what employers will be seeking then. The Germans at least try to get organisations and universities together to plan this, but for everyone else it is turkey cycle time: the market wants C++ programmers, everyone sets off to do that, and in four years there is a glut - a bust. Then nobody trains and four years later salaries go through the roof. Business degrees are far the most popular major, and that's where people are getting jobs. People who took non-vocational subjects, well they're jamming the vocational schools. Community colleges are filled with people who have already got college degrees, trying to get practical degrees:maybe plumbing, carpentry. But you can't learn this stuff in a classroom. You can't learn to be a plumber in a classroom, or a carpenter or a machinist. And neither can you learn to be a manager in a classroom. So what's really the issue? Companies want to buy off the shelf what other people have taken the trouble to create - technically up-to-date individuals, with several years experience. But none of them are prepared to train such people, and if they do, they get poached. Employers want people who are trained in what they need, but they are not prepared to say in advance broadly what needs they are going to have, although most will do quite detailed manpower planning. So there is an externality here, badly in need of solution. Should we mandate training? Award tax breaks for it? Get employers to be more open, through industry bodies perhaps? Many, many studies show that bad selection is a very costly business, and that seeing a recruit close up for a year or so is the easiest way not to make a mistake. Maybe we need to systematise this, define the economics of it and set up standards. Look, we have apprentice programs, for example, long-standing solution to work-based skills. Law firms operate like this - up or out - and so do consulting firms operate, taking super-bright people right out of college. It is done, and it is economic. So here is where a difference can be made at damn all cost. I think you need to focus somewhat more on demographics. By 2025, one in five Europeans will be more than 65 years old, up from 16 percent in 2002. Household financial wealth, which had egrown steadily will slow drastically. Three of Europe's biggest economies—the United Kingdom, Germany, and Italy—will have $4 trillion less than on historical trend. Germany's population, with a median age of 42 in 2005, is already significantly older than the populations of the United Kingdom or the United States. By 2024, Germany's median age will climb to 47. The number of people aged 65 and older will rise from 27 percent in 2003 to 33 percent by 2024. Italy, which has seen big demographic changes over the past two decades. The number of households aged 65 and older increased by a staggering 55 percent from 1986 to 2003. By 2024, Italy will have more than one million people over the age of 90, and the median age will be 51—by far the highest in Europe. Perhaps in the world, implying thattheir economic problems have barely begun. The populations of Japan, the United States, and Western Europe, where the vast majority of the world's wealth is created and held, are aging rapidly. During the next two decades, the median age in Italy will rise to 51, from 42, and in Japan to 50, from 43. In just 20 years, household financial wealth in the world's major economies will be roughly $31 trillion1 less than it would have been if historical trends had persisted. The Chinese economy is in a similar situation, due to the One Child policy. Women in Italy now average just 1.2 children. In the United Kingdom, the figure is 1.6; in Germany, 1.4; and in Japan, 1.3. Meanwhile, thanks to improvements in health care and living conditions,2 average life expectancy has increased from 46 years in 1950 to 66 years today. In Japan, the situation is much more serious. Household financial wealth will actually start declining during the next 20 years: by 2024 it will be $9 trillion—47 percent lower than it would have been if historical growth rates had persisted. Japan's demographic trends are severe: the median age will increase to 50, from 43. The Chinese Census Bureau predicts that China’s population will peak in 2026. Births are now 30% less than the replacement rate. Its labor force will shrink, and its over-65 population will more than double over the next 20 years, all of them reliant on and therefore running down personal savings as there are limited or no pensions in China. It will, therefore, age very rapidly. Japan has had the great advantage of growing rich before it grew old. By 2030, China will have a slightly higher proportion of the population that is elderly than western Europe does today - and it is worth recallig that western Europe has a higher median age than Florida. Aggressive effort to increase immigration won't solve the problem, simply because new arrivals represent only a tiny proportion of any country's population. In Germany, for instance, a 50 percent increase in net immigration (to 100,000 people a year) would raise total financial assets just 0.7 percent by 2024. In Japan, doubling official projections of net immigration would have almost no impact on the number of households or on the country's aggregate savings. The same is true even in the United States, which had the highest historical levels of immigration in our sample. The World Bank published a study of the impact of banking crises as long ago as 1997. The outcome was that, across at least forty countries and fifty years, banking crises had the potential to trim an average of ten years growth from a country's economic potential, Most potent of all were debt-driven crises. Three academic studies of the US panic years of 1873 and 1929 have just been published, plus an analysis of 1989 in Japan. The average low in interest rates in these cases occurred almost fourteen years after their respective panic years. (The average rate was 2%.) Even twenty years after such crises, long-term yields were still depressed, showing an average yield of 2.5%. Each event, across a cultural span, produced highly similar and long lasting patterns. The economic conditions that began with the 2007 crash were caused by extremely similar conditions. This, perhaps, hints that both yields and growth will take a long time to return to historical trend. In turn, this would suggest that current difficulties will take much of the scenario period to purge; indeed, twenty years from 2007 takes us to 2027. Set against this, we are perhaps more competent in our policy and analysis, and the impetus to growth does not rest solely on the affected countries In addition, technological and human potential are both expanding very rapidly. The "What If" asked if the West might become less "materialist" and more intent on finding hapiness in smaller ambitions. These papers suggest that it may have no option but to do this. However, one can expect levelling, probably blaming and spiteful politics in the train of this. Japan's Great Recession was the result of a series of macroeconomic and financial policy mistakes. After the asset price bubble had burst, the Nikkei fell over 60% and land prices fell by over 70%. The authorities failed either to analyse the problem correctly or to take appropriate action, not least due to the disproportionate power of the banking sector. However, in precisely the same way as we still have our factories and workforce but are making sub-optimal use of them, so nothing organic prevented Japan from resuming growth. That it did not do so was down to a combination of poor policy, general bewilderment and commercial uncertainty. Economic expansion came to a total halt in Japan during the 1990s. There is much talk of "us" - the West, the US, the UK - "becoming like Japan". This implies that there is an economic black hole that exists as a state of being into which japan fell and into which we are in danger of falling. This is not so. As Posen has suggested, it is better to think of Japan's prolonged recession as demonstrating the validity of much textbook macroeconomics. What Japan needed was the renewal and recapitalization of its banking system, and for the state to pursue consistent, solid expansionary monetary and fiscal policies. This is did not do, as a species of doom-laden fatalism seemed to settle upon successive administrations. The spell was broken by the Koizumi, Takenaka and Fukui administration, which took fiscal policy to neutrality, forced the banks to write off their chronic bad balance sheets and to capitalise themselves and which encouraged monetary expansion. Japan has not returned to the glory days of the 1960s, but it had resumed good growth before it was hit by the global crisis and, later, the tsunami. To reiterate, then - there is no syndrome, no pre-ordained doom that has befallen Western economies, making them "Japan-like". We are not doomed to long periods of low growth, whatever history may say about previous recessions. these were either a long time ago, or in a country far, far away from contemporary best practice. The figure shows US money velocity as based on M2. (For those not in the know, this measures how fast the stock of money is in circulation. Money stock times money velocity equals GDP.) What is clear if that following a gentle period of growth (shaded) this figure exploded to unprecedented heights in the pre-collapse phase. It has since collapsed, and is now well below average, which is why monetary stimulus has limited effect. The more we have added, the slower the money has moved around. Why, then, is money slow to move around? Corporate profits are at record levels in the US entirely because firms are not investing. Banks are not lending to firms, chiefly because there is demand only from those in distress, to which banks not unnaturally do not wish to lend. Project hurdle rates are extremely low, as interest rates are real-terms negative. Companies are paying out nugatory dividends. Although organisations have all manner of plans which they have moth-balled "for better times", very few are acting on these or doing much more than essential maintenance. Some are eyeing the possibility of M&A given the low valuation of current targets in today's capital markets and the absurdly cheap capital that is available to those well rated, but none are taking action. They see weak demand and extreme economic uncertainty, and prefer to sit on their hands. States have, of course, cut spending (growth) in an attempt manage their internal deficits. This plainly has an effect on demand. However, the main fall in demand growth has been down to reduced consumer spending, itself based on debt reduction and an unwillingness - or inability to borrow. Lower personal assets due to asset price deflation - notably, falling house prices - have had a major impact. 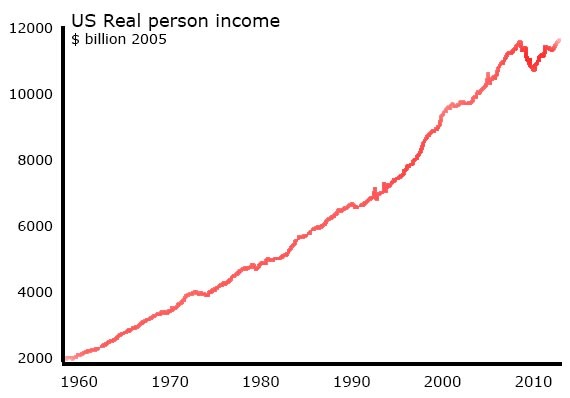 Consumer incomes are not much down and in some cases substantially up on the pre-crisis levels: see the figure below. In essence, consumer attitudes have also switched risk aversion, and they too are sitting on their hands. What are the uncertainties? Well, there are some real ones and some fake ones. The real ones are first, the Euro crisis and second, the unresolved nature of the banking debacle. Both of these elide into a general sense that government is not prepared to take decisive action, that the Western economies are under threat from Asian competition and that power groups - bankers in particular - are "getting away with it". A significant fraction of young people of all educational attainments agree when asked if the West (or America) are under the control of secret, selfish minorities. In essence, for the man in the street, the old model is broken. Old skills are no longer recognised. Social support is in retreat. Many are getting old, and many young cannot get jobs, or hear that they cannot get jobs. There are no clear messages about what is wrong and about what is being done to put this right. The only people seemingly willing to fill the communications gap are extreme political figures - the Tea Party come to mind - or depressing groups who wail about the environment, poor health and other social problems, the inevitable decline of "capitalism" and "the West" and so forth. "The best lack all conviction, whilst/ The worst are filled with terrible intensity." For commerce, some of this feeds through directly, as a part of the zeitgeist, and some is seen as trimming potential demand. Commerce is, however, chiefly concerned with the more practical issues that are described above, which comes down to plans to resolve bot the Euro and the potential for the banks to drop another major brick. Recent reports about the Libor scandal, the seeming inability of Morgan Stanley to control one trader who had been pursuing a suicidal policy for months: none of them contribute to belief that banks have regained their sense of place in the polity. Increasing brittleness in China - and a general slow down in the emerging economies - does not help. So: political "leadership, leadership, leadership" as Tony Blair might have said. We really need senior figures to speak out, to explain, to take action. If the Euro is non-viable, seek a least painful exit. Require banks to conform to simple practice, or simplify them. Explain. Do stuff. There is no reason to suppose that we are doomed to a protracted recession. If action is not taken, however, this is precisely what will happen. That is the lesson of Japan.